CP-50 Compact EVSE Tester from ClipperCreek is the perfect tool to test and troubleshoot an EVSE without a vehicle present. 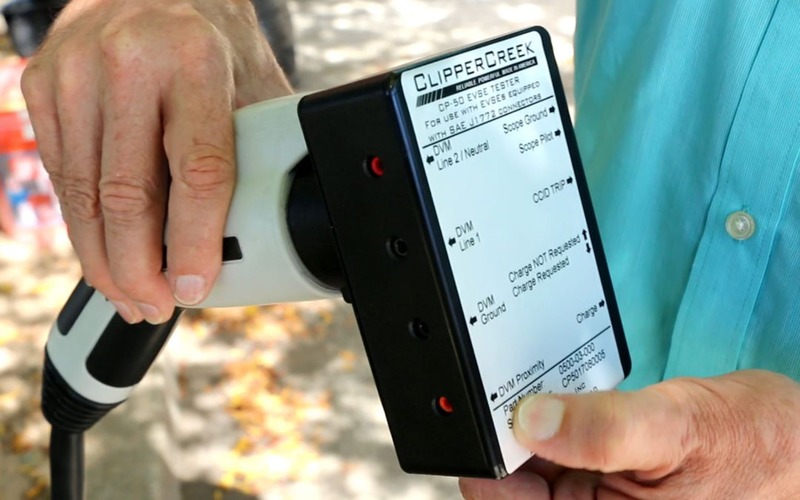 ClipperCreek, Inc. recently released the CP-50, a tool for the installation and maintenance of Electric Vehicle Supply Equipment (EVSE). The CP-50 is a compact and reliable hand-held testing tool designed for installers, technicians and facilities maintenance personnel. It is offered at just $250. The CP-50 can function as a stand-alone device or in combination with a DVM (Digital Volt Meter) and/or oscilloscope to verify operations and perform advanced troubleshooting on an EVSE or vehicle charging issue. The CP-50 is designed for use with ClipperCreek EVSE, and should be compatible with all other makes and models of Level 1 and Level 2 EVSE on the market. “As the plug-in vehicle and charging infrastructure markets continue to grow, our customers have been seeking a simple and convenient way to verify operation and troubleshoot charging infrastructure. We are pleased to introduce the CP-50 at a great value to meet this market need,” said Jason France, President and Founder of ClipperCreek. The CP-50 can be added to enhance efficiency of a facilities charging infrastructure preventative maintenance and testing routine. Designed for compatibility with all Level 1 and Level 2 SAE-J1772 EVSE the CP-50 functions as a quick and simple diagnostic tool to troubleshoot vehicle charging issues. For more information please visit https://store.clippercreek.com/evse-tester or call ClipperCreek at (877) 694-4194. Hello Nayebi, Thank you for asking, to test an EVSE with the CP-50 the EVSE would need to be connected to power. The CP-50 can function as a stand-alone device or in combination with a DVM (Digital Volt Meter) and/or oscilloscope to verify operations and troubleshoot an EVSE.